Comments: The graphics, music and adventure story are all there and they are the reasons we all love Jewel Quest. Then along came solitaire and messed everything up. I'm not saying solitaire is a bad game but to have to play hands over and over trying to advance the story got boring real fast. I had to play level 1-1 six times to advance. Knowing how Jewel Quest gets pretty challenging I can't imagine how many card games I'd be forced to play down the road. 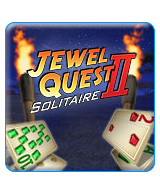 I'll pass on the solitaire part and just keep to old-fashioned Jewel Quest.